Boiling up a bag of edamame is even easier than making ice pops, so you could say this is something of a lame thing to post about, but I’ve really been meaning to share my appreciation for this useful food item for a while now. And today, Mother’s Day, when it happened to save this mom a lot of trouble over dinner, seemed like the right time. At under $3 per bag of frozen (even organic!) edamames make for a reasonably priced appetizer or T.V. snack for two to four people. Soybeans are full of fiber and anti-oxidants and contain no animal fats (but do contain those all-important omega-3 oils). They are tasty and quick to get on the table, and shelled, can replace lima beans (which I hate) and peas (which I quite like) in many recipes. But what I really love about them is how companionable they are. They remind me of an leisurely, chatty evening shelling pigeon peas around a hurricane lamp in the mountains of Dominican Republic when I was doing a little humanitarian work. They remind me of dining at an Asian restaurant in San Juan with my dear, departed friend, Frances Borden, in the early days of our friendship. They are how my son and I might start a meal…popping beans right out of the pod and into our mouths (and laughing when the beans shoot across the room instead), or how we might sit around watching the news with my parents, the pile of full pods getting lower and the pile of empty pods getting higher. Farmer Steve got Leandro to try the fresh garden peas we were picking at our C.S.A. last year, because they look like edamame pods. So get a bag and keep it in the fridge for the next time you don’t know what to do for dinner and need to buy some time, or you want something more virtuous than chips to accompany your favorite show or a movie night. Boil up a quart or so of water and add 1 lb. 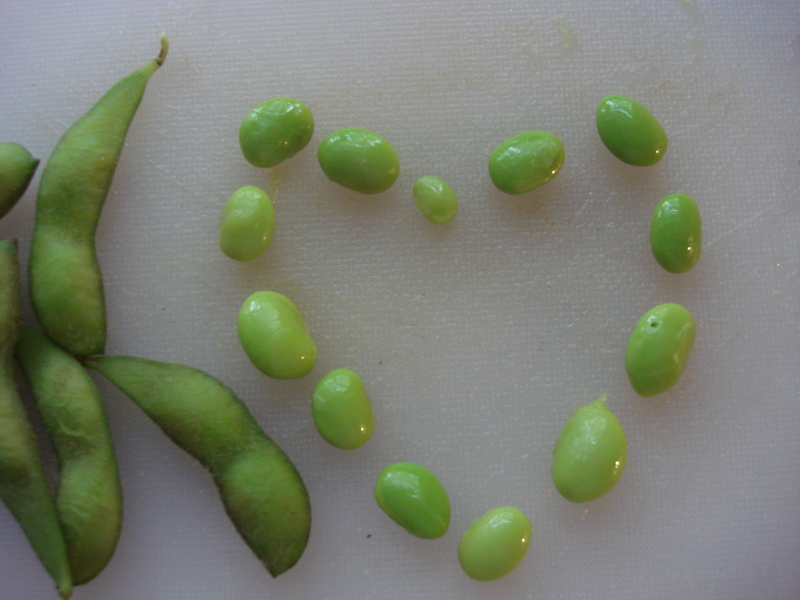 frozen edamame in the pods. When the water returns to the boil, cook for three minutes, drain and serve. 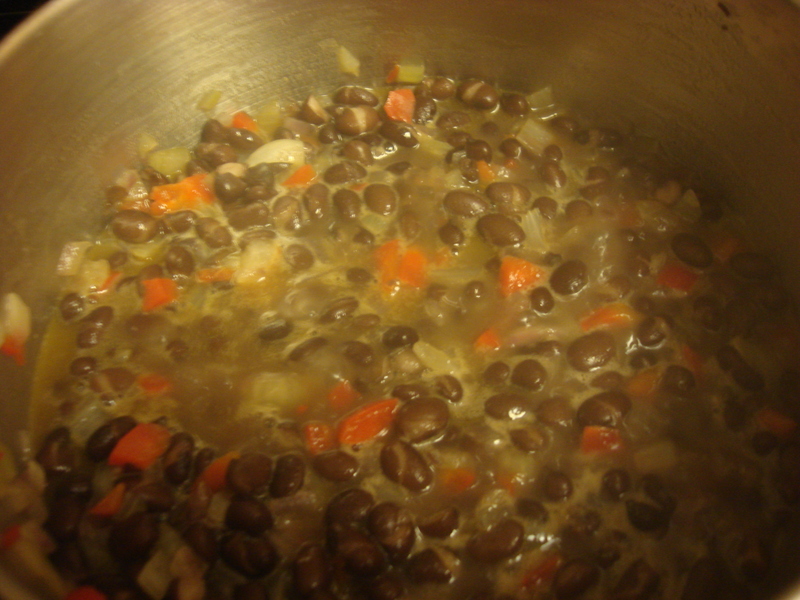 Leftover beans can be added to salads (including rice and pasta salads), stir-fries and soups. 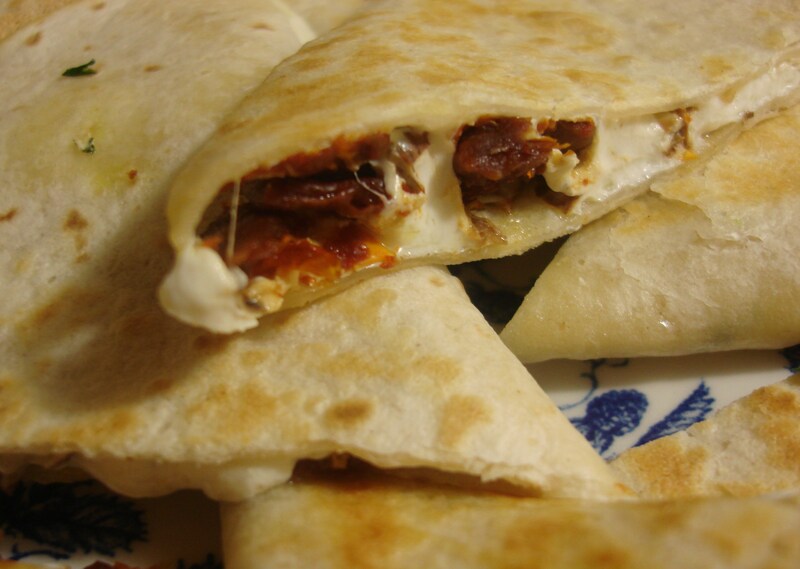 5-minute Meatless Chorizo Quesadilla? Try this! Spritz of olive oil or cooking oil spray. Heat a small amount of oil in an 8-inch nonstick skillet. Place a tortilla in the skillet. Cover half the tortilla with a layer of cheese and a generous sprinkling of tomatoes, leaving a bit of a margin at the edge. Fold the empty half over, press down and heat through, turning several times during cooking. When the tortilla is just turning golden and stiffening, it’s done. Repeat with remaining tortillas and allow to cool just enough for the melted cheese to firm up for cutting into triangles. Serve with guacamole/salsa/sour cream. The whole Super Bowl thing has got me thinking about creative solutions for portable party food that doesn’t bore, travels well without dripping onto your car seat or collapsing en route and isn’t unwieldy if you take public transport. It should look nice – presentation counts for a lot. If you are not sure whether the crowd is primarily vegetarian, a meatless dish can be a very thoughtful additon to a party buffet. And of course, you want it to be simple and easy. Enter Feta Walnut Spread. I made it in a few minutes with the help of my food processor, ably pulsed by my three year old (DISCLAIMER: My son is a good eater, but please don’t think he’ll eat everything I make or that you see on this blog. He refused to try this spread, even though he participated in the making and really likes feta cheese in other dishes. Can’t win ’em all ). We took it to a Valentine’s playdate-party for my Single Moms By Choice group this weekend. I can’t say it won everyone over, but I liked it a whole lot with the vegetable sticks I cut up. I think next time I will pair it with toasted pita chips (they won’t compete as much with the flavor of the spread) and I think that the leftovers will make an excellent alternative to mayo on chicken or vegetable sandwiches. The original inspiration comes from Molly Katzen’s Moosewood Cookbook, which I had to buy again after my well-worn original fell prey to a hurricane-related flood in Puerto Rico years ago, and which I was delighted to find still had all the recipes written by hand. Pulse the walnuts and parsley in a food processor until blended. Add the rest of the ingredients (except the garnish) and puree until smooth. Transfer to serving bowl and cover tightly. Place in fridge to chill. Before serving, drizzle with olive oil and sprinkle with oregano and red pepper flakes. 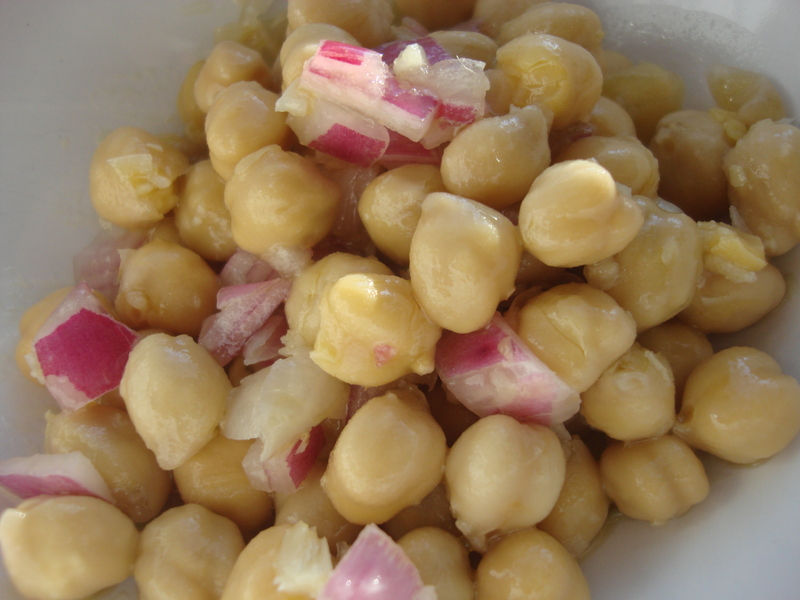 Serve with toasted pita chips or as a dip for crudité. As a Caribbean person, I often forget the existence of fresh cod. In my world, cod is called bacalao, usually comes in salt-crusted bricks or paddles, much as it was when it arrived in the New World, masterminded by intrepid Basques and other seafaring peoples, to make an important (and tasty) protein source last and last and last. It has to be soaked for ages with many changes of water and, if you don’t like fishy-fish, you are probably not going to like bacalao. I promise that I will get to the fresh (non-fishy, non-salty) version in a second and give you a killer recipe that is all flair and no hard work and can be used with any firm-fleshed white fish, but indulge me for a moment as I take my tastebuds for a saunter down a Puerto Rican Cuisine Memory Lane. Think batter-fried bacalaitos (best-eaten from a battered pot full of dubious grease bubbling over coals at a palm-roofed beachfront kiosk marshalled by an old lady in rollers and washed down with an ice-cold Medalla beer), or shredded into rice (arroz con bacalao) for the holidays, or dressed with vinaigrette and served with boiled tubers (serenata) on a Lenten Friday, or in a reddish sauce with hard-boiled eggs (bacalao a la vizcaína) any old time. I am dabbing nostalgic tears from my eyes and nostalgic water from the corners of my mouth right now, overwhelmed by food memory. Fortunately, my present latitude offers some solace. As a Caribbean person adapting to living in the cruel Northeastern winter, frozen fish has taken the place of salted fish (and fresh too, to be honest). And so, I recently discovered the wonder of some vacuum-packed slablets of frozen fresh cod (a phrase which only makes sense in contextual comparison to salted fish) at, you guessed it, Costco Warehouse. As it is “Wild Alaskan”, it is also a good choice from a non-polluted environment and in terms of sustainability (visit the Monterey Bay Aquarium Seafood Watch site if you are concerned about that sort of thing http://www.montereybayaquarium.org/cr/cr_seafoodwatch/sfw_recommendations.aspx). I sauteed a couple experimentally just for me and the result was a quick yet good-looking plate of big flakes of fish just sliding apart and yet another way to incorporate capers into a dish. This one I would definitely serve on date night. Heat oil and butter together in a heavy skillet at relatively high heat. Using about ¼ tsp salt, sprinkle fish on all sides. Do the same with the pepper, preferably fresh cracked. When the foaming of the butter subsides, cook fish on each side at high heat until just white. Then lower heat and cook on each side from 4-6 minutes each (I prefer my fish somewhat undercooked; if you are just learning to cook fish, simply use a fork or knife in the center to check for done-ness: no more translucence). Remove cod and set on a plate (preferably warm). In the same skillet, sauté the onions in the oil and butter at medium high until wilted and somewhat tender. Add the capers to warm them up. Then spoon the onions and capers over the fish and serve. This fish would be great over wilted greens, polenta or couscous or with Snap and Go Asparagus. I ate my second slice cold over salad and it was yummy! So we spent another evening in the emergency room and Leandro got another four stitches, this time in the forehead. With that kind of excitement going on, you can be sure that once the chocolate ice cream dinner for brave boys was up, I was STILL going to be too tired for anything elaborate in the kitchen. Marcella Hazan to the rescue. This queen of the kitchen’s Essentials of Italian Cuisine is a much loved and much soiled recipe book over here. 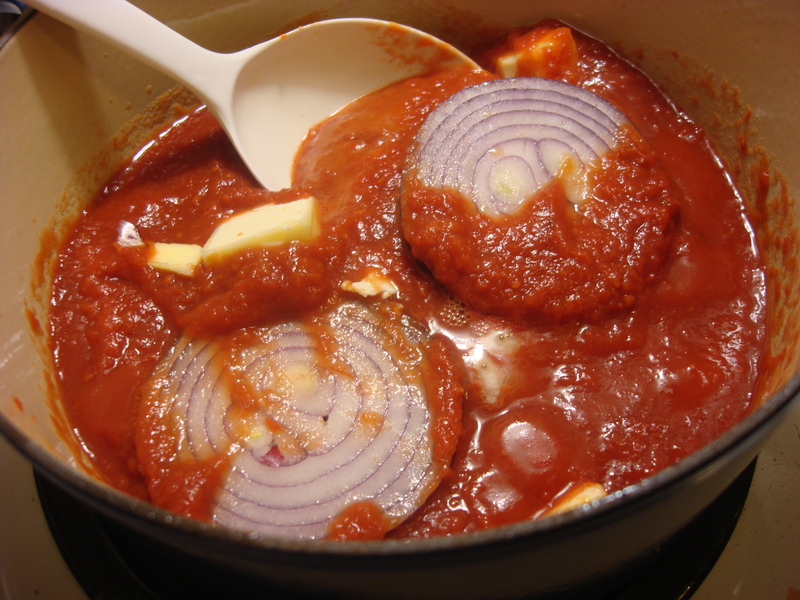 These days I don’t have the resources for some of the more ambitious dishes, but her tomato sauce with onion and butter is simple and perfect: three ingredients resulting in one glorious, sweet, rich sauce that you barely have to stir! I have adapted it slightly to make it even faster (puree, rather than whole tomatoes, adjusted the butter, for example). The beauty of this one is that it can be done in the time it takes you to boil up the pasta. Marcella recommends potato gnocchi under the sauce, but the pre-prepared ones are generally yucky and I ain’t making gnocchi myself any time soon (oh for the heavenly days that Fabiola made it for me in Rovereto!). 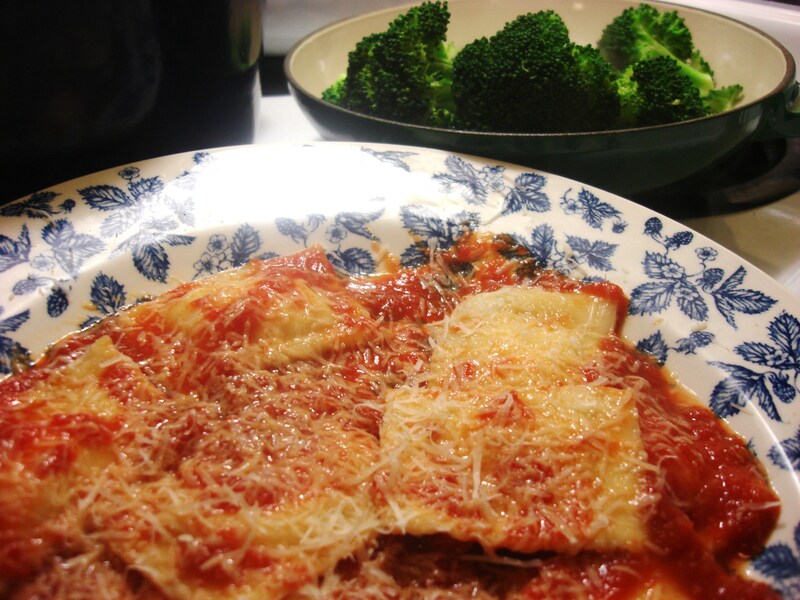 These days I buy fresh ravioli from Fairway Market (no preservatives and a variety of fillings – $6 for 24) and actually freeze it. It breaks off into convenient serving sizes and takes about 15 minutes to cook after you drop them in the boiling water and the boil comes back. They re-heat pretty nicely, so I make extra for my little guy’s lunch box, just adding a dab of butter to the hot ravioli so it doesn’t stick. Cook all three ingredients together in a deep pot with a lid at medium to low heat until the fat begins to separate from the tomato (about 20 minutes, or the amount of time you spend boiling the pasta). The longer you cook it, the sweeter it gets, so if you have more time, use it! In a perfect world we would sit together over a lovely meal of toast and fruit and yogurt, maybe eggs, smoked salmon, cheese. But no. My less-than-perfect world is manageable in part because I concede to my son having breakfast in the car at 6:45 a.m. (well, more like 7, cause I am always running later than I mean to) on the way to daycare and work. The result is less-than-satisfying (not least because my car is a bio-hazard and we should be wearing hazmat suits while in it), but he eats and I get to listen to the news in relative peace. I know that cereal bars are considered a fair option in many circles, but have you read the labels? High fructose corn syrup, sugar, dextrose…might as well hand him the Chips Ahoy. And he’ll get cereal bars at school anyway, about which I just shut my mouth. He might have buttered toast (I buy fresh-baked multi-grain at the Fairway – they slice it and I freeze it; or one of those sprouted grain loaves that actually come frozen), but I also have another trick – we call them mini-pizzas (marketing is everything). Top the crackers with the sliced cheese. Bung into the microwave for 13-15 seconds. Slice into squares. Put in a plastic thingy and serve once we are strapped in the car. NOTE: Usually he eats the slightly melty cheese and hands the crackers to me on the Southern State during Morning Edition. He’s got a juice and water mixed drink and grapes (when I am not paranoid about sudden choking on the parkway) or a peeled apple. It ain’t the I-Hop, but I won’t pay their prices anyway. A rocking go-to recipe, with Latin flair and yes, a short-cut. I admit it; I use a stock cube in this one. So sue me. Heat oil in a small pot on medium high. Add onions, stir, then lower heat to allow to soften. Add beans, 1/4 can water and stock cube and simmer up until the rice is ready. Serve over rice. Or roll up in your favorite wrap with some cheese.